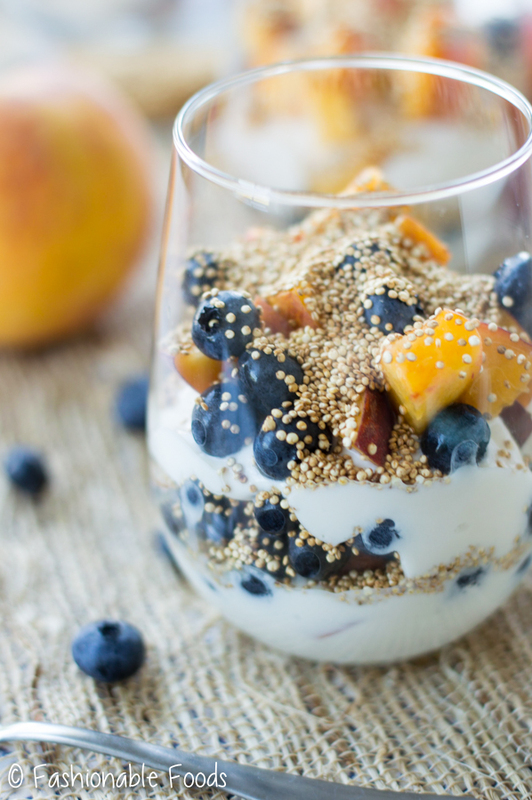 You’ll never believe it only takes 5 simple ingredients to make these tasty puffed quinoa, fruit, and yogurt parfaits! The puffed quinoa adds such a fun texture and is a nice change up from the usual granola. Use your favorite fruits for different variations! Hello again, friends! How is your Tuesday morning treating you? Did you have a nice weekend? I had a couple of friends visiting, so there was plenty of fun here! We talked, laughed, enjoyed the nice weather, hit the beach, and as per usual… drank lots of wine. Is it possible to have a girls weekend without wine? I think not. ? Today begins yet another heat wave here. Temps in the high 90s, heat index into the 100s. I’m not complaining, though! I really love hot summer days… most of the time. One thing I don’t love is heating up my oven or stove when it’s super hot out. In fact, I tend to not eat much when it’s hot. Enter today’s parfait recipe! 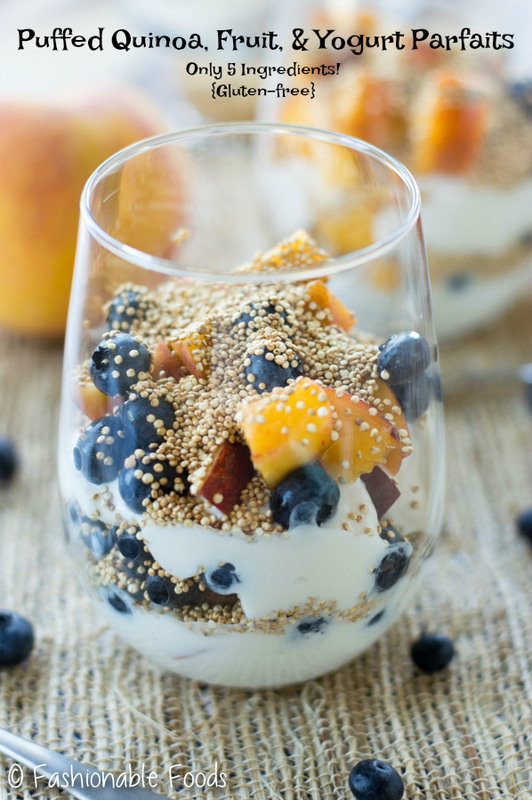 Puffed Quinoa, Fruit, and Yogurt Parfaits. Perfect summer breakfast, lunch, snack… even dinner. I actually ate this for dinner last summer on the day I shot the recipe. Yep, I’ve had these photos hanging out on my computer for a year now. I’m finally getting around to sharing now that peaches and blueberries are plentiful! I’m sure you all know by now how obsessed I am with peaches and blueberries. I love them on their own, but I especially love them together – it’s the best combo! Not only are these puffed quinoa parfaits tasty, but they are extremely simple and only require 5 ingredients! And, you only need to heat a pot over the stove for a few minutes to “puff” the quinoa. Basically, you add some uncooked quinoa to a hot pot, cover with a lid, and shake until you heat it lightly popping. Think of it like making popcorn. The quinoa won’t increase in size like popcorn does, but it does get a lighter texture and a nice toasty flavor. And, it adds a great crunch to parfaits as a healthier alternative to granola! Puffing the quinoa is the hardest part… and it’s not even hard. The rest is just assembling. Mix some greek yogurt with maple syrup just layer everything in a glass! Super simple and very tasty. You can actually make this recipe the night before and enjoy a parfait for breakfast. Quick breakfast for a busy morning! You can also just keep the ingredients separate and assemble when you’re ready to eat. Either way it’s delicious. 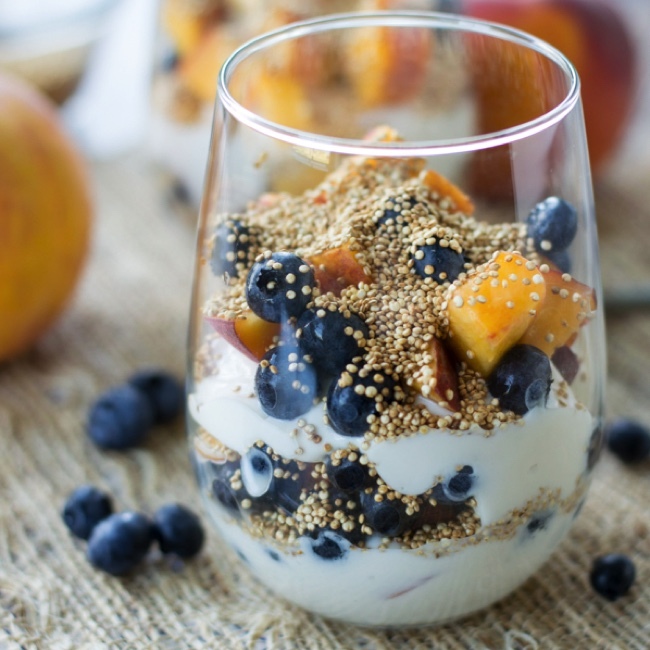 Peaches and blueberries are a great summer combo, but you can change up the fruit to whatever you like, or whatever is in season. Apples with cinnamon for fall… pomegranate and orange for winter.. you get the idea! If you’re in need of a quick and tasty breakfast to keep you cool this summer, look no further. 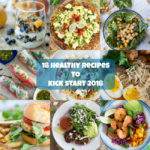 You’re going to love this one! ? 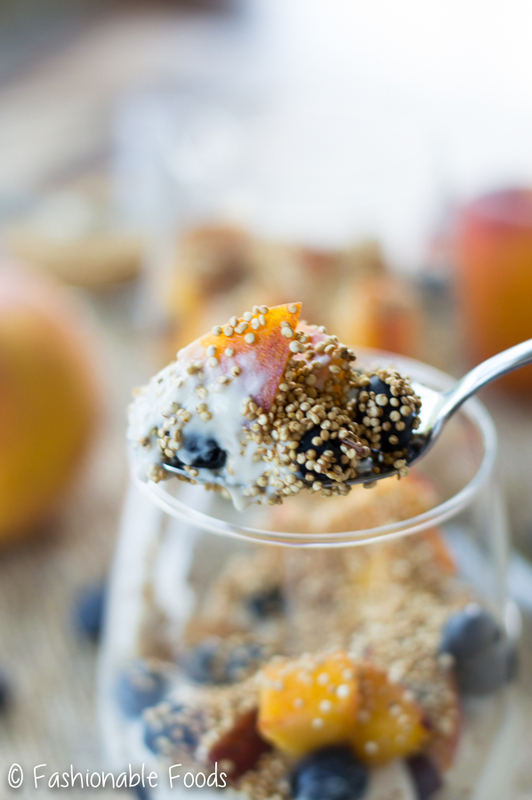 You’ll never believe it only takes 5 simple ingredients to make these tasty puffed quinoa, fruit, and yogurt parfaits! 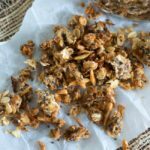 The puffed quinoa adds such a fun texture and is a healthier replacement to granola. Use your favorite fruits for different variations! Heat a deep pot (with a lid) over high heat. You want the pot really hot! Add ¼ cup of the quinoa to the pot and cover with the lid. Move the pot around and allow the quinoa to pop. You must keep the pot moving or it will burn! Once it smells toasty and the popping has slowed, you can remove the quinoa to a foil-lined baking sheet to cool. Repeat with the other ¼ cup of quinoa. In a bowl, stir together the yogurt and maple syrup until smooth. Assemble the parfaits by layering half of the yogurt equally among 4 glasses – I used stemless wine glasses. 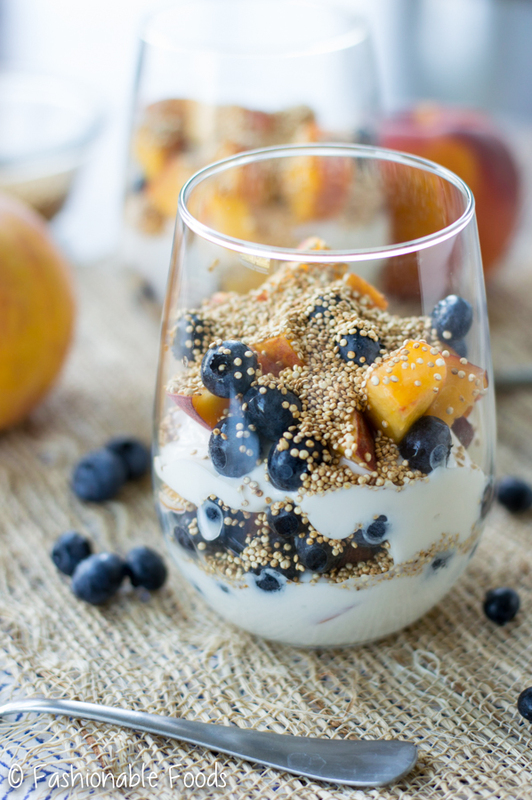 Layer in half of the fruit equally over the yogurt and then sprinkle in 1 tablespoon of the quinoa in each glass. Repeat with the remaining yogurt, fruit, and finishing it off with the quinoa. Serve immediately, or you can let them sit overnight and have them the next morning! *For a dairy-free version, try your favorite dairy-free yogurt! *I found 3 tablespoons to the perfect amount of sweetness, but you can do this to taste. 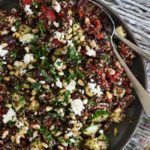 I am absolutely loving the idea of adding puffed quinoa instead of usual granola. These look so pretty and delicious, Keri. Loving this is made only with 5 ingredients. Ok, this may sound silly Kerri, I love love love puffed Quinoa, but I’ve never had it in the comfort of my own home. I didn’t realize I could easily make it on the stove. I’m going to make your recipe tomorrow. The prepartion and looks of the dish is perfect. It’s been SO hot here too, with lots of storms, but I’m not complaining! 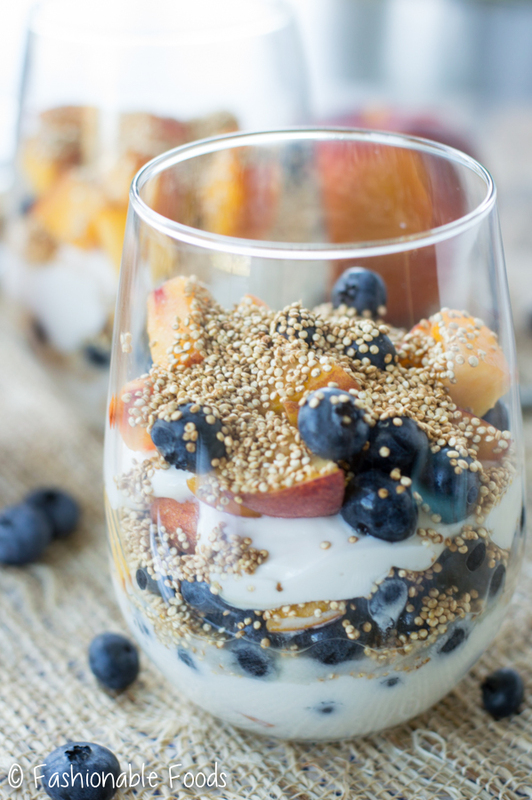 Love these puffed quinoa parfaits! Blueberries and peaches are my favorite, too, so I’m wishing this was my breakfast this morning. So pretty!